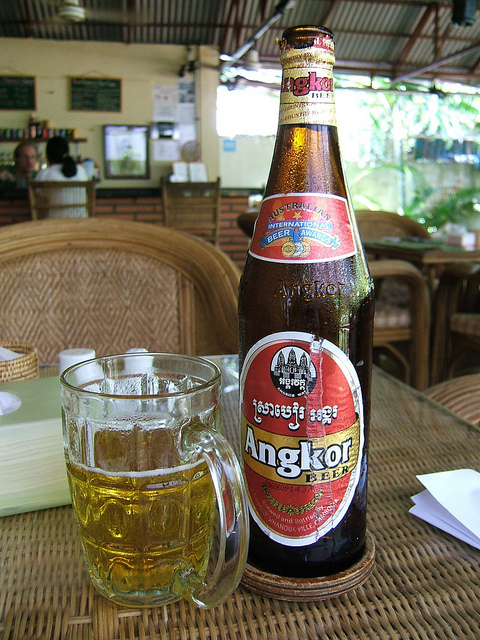 Now this is not a post that A ever expected to write: South East Asia is not exactly a place renowned for its beer. Having lived in Germany and the UK, he has rather fixed ideas of what a good beer should be like. He's all for a hoppy warm IPA, a malty Porter, a treacly Altbier or a cold, frothy Pils, but the thought of a watery Asian beer such as Tsingtao which is brewed with rice as well as barley didn't exactly fill A will pleasure. As an aside, Tsingtao is not alone in adulterating its brew: both Stella and Peroni wouldn't meet the requirements of the German Reinheitsgebot (Beer Purity Law) as they cut their beer with maize, but that's a moan for another time. However the beer scene, while nearly all light lager and the quality is extremely hit and miss, there was a lot more variety than expected. Here's a round-up of some of the offerings you may or may not have heard of and which you may or may not want to try. None compare to the best of the British, German or American craft brewing traditions, but all of the below are fun and worth trying once at least. Well known to Brits and probably to many others due to their sponsorship of Everton, this is now Thailand's biggest brewer, producing more hectolitres than the ubiquitous Singha. 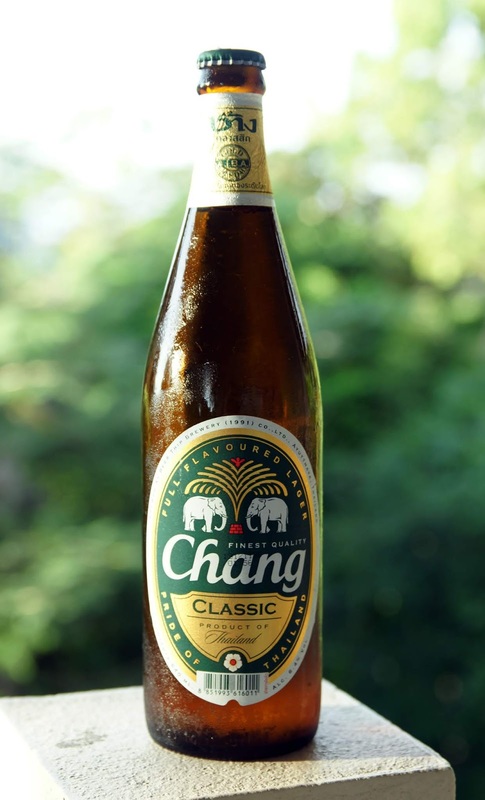 While Chang is fairly average as a beer, drinking it is a bit like playing Russian roulette with alcohol.. The bottle states a percentage ABV, but this is more of an indication than anything else. Alcohol content is said to vary significantly from batch to batch and in our experience, one day's brew has no effect at all, while the next feels like you've been coshed with the bottle in the morning. You can get it in the UK, but it's brewed under licence and is a lot less fun when the brewing process is more carefully monitored. This one is from Laos. The Pilner, which markets itself a rice beer (unlike Tsingtao it's happy to make a selling point of its prime ingredient), it gets good reviews A was a fan of the dark variety, which is more reminiscent of German black lager than anything. It's sweet, malty and actually drinkable. It also comes in these quaint little bottles with black labels. I understand you can get it online in the UK and there are probably one or two specialist outlets that stock it. 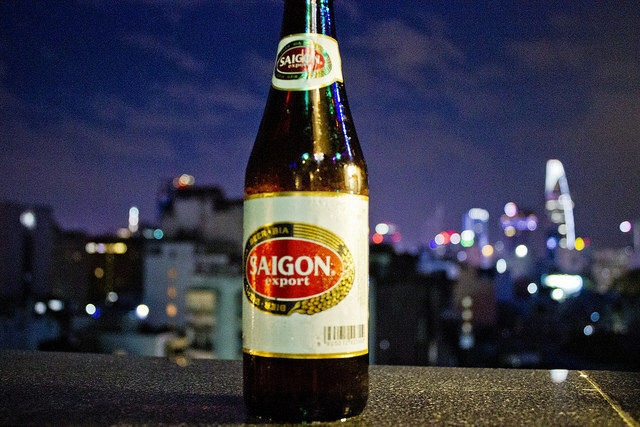 Tastes like Saigon lager (described below), but like so much else in Cambodia, it's trades on the image of Angkor Wat on the label. It is what it is, but it's worth trying. Weapon of choice in Ho Chi Minh City and the rest of the Mekong region, Vietnam's most renowned beer is the best offering in a country where the choice of tipple is strictly regional. Southerners are known to be party animals compared to their northern cousins, and part of the reason may just be the beer. This stuff is so much better than the puddle water known as Hanoi lager. If in Vietnam, settle for nothing less. This tipple is drunk in the middle of the country and makes a worthwhile alternative to Saigon. It has little flavour and is inoffesive in the heat, but you probably wouldn't want to drink it here, but the bottle is pretty and A was happy enough to tick it off the list.